By watching the video above, you can hear from Dell EMC employees about the ways in which Dell EMC's flexible work solutions helped them to maintain work-life balance. 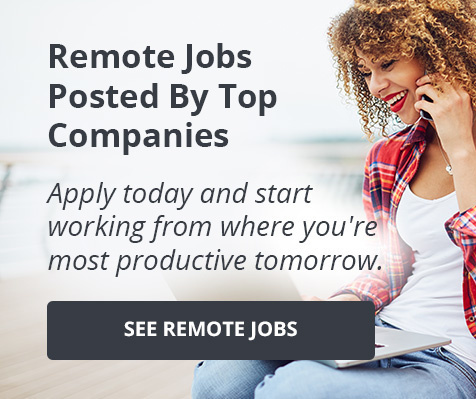 If you're interested in applying for one of Dell EMC's remote positions, then click here to see all available opportunities at Dell EMC and don't forget to press 'Follow' to receive custom job matches, event invitations and more! Below is an article originally written by PowerToFly Partner Synchrony. Go to Synchrony's page on PowerToFly to see their open positions and learn more. Every workplace should strive to support their LGBTQ staff. Not nearly enough do. A year ago, Synchrony employee Giselle learned that the company would be releasing the second edition of its Transgender Reference Guide, designed to help managers and Human Resources staff better serve their transgender colleagues. Giselle immediately volunteered to help with its production. "As soon as I heard about this project I raised my hand to share my story," Giselle says. Giselle was born outside the United States. She came here years ago to both pursue a career and live her life freely as a [trans] woman. Her journey took incredible strength and courage, and she wasn't always met with open arms. Prior to joining Synchrony, Giselle didn't always feel welcome at work and sometimes struggled to receive equal treatment. Synchrony was different. Here, Giselle says, she was treated like any other Synchrony employee. Her coworkers made her feel at home. It wasn't long before Giselle sprung into action, joining the company's Lesbian, Gay, Bisexual, Transgender+ Network and becoming one of its most active members. One of the Giselle's proudest accomplishments is the professional relationship she built with one 'n' ten, a nonprofit organization serving LGBTQ youth in the Phoenix area. One 'n' ten promotes self‐expression, self‐acceptance, and leadership development — values Giselle has always held close to her heart. She wanted to build a bridge. "Throughout my life, there has been someone to lend me a hand, so I always try to give back," Giselle explains. The support Giselle received at Synchrony made it easier for her to grow professionally. Giselle started as a bilingual Customer Service Representative in 2013, before being offered a role in the Translations department in 2015. In 2017, Giselle was named Empowerment Ambassador for Phoenix. At the company's Annual Diversity Symposium that year, Giselle was awarded the LGBT+ Network Diversity Leadership award. Just recently, the second edition Transgender Reference Guide Giselle worked on for Synchrony was published. Of course, Giselle has done more than advocate for the LGBTQ community at work. Professionally, Giselle is working forward to becoming a manager or project manager at Synchrony. She's found a community where she feels accepted – and now she wants to make that community even larger, and more embracing. "I couldn't be happier to be at Synchrony," she said. "By sharing my story, if I can change at least one person's mindset and perception about transgender people, I will be very happy knowing I have accomplished my goal." Below is an article originally written by PowerToFly Partner Stripe, and published on December 7, 2018. Go to Stripe's page on PowerToFly to see their open positions and learn more. I started at Stripe as a newly minted engineer two weeks after finishing university. When I was interviewing with tech companies, I kept asking myself what I wanted to work on (and was often asked this question). The "what" seemed like it was most important thing, but I quickly realized I had no idea what I wanted to work on. After spending a day with Stripes during my job interview, I realized that maybe the "who" — the people I would call my teammates — was more important than any one project. A year and a half at Stripe later, that still holds true. In my first two weeks in my new role, I went through what we call Stripe 101 and /dev/start, spin-up programs designed to teach about Stripe's products and culture and get new Stripes started on a technical project. I also met my spin-up buddy, a fellow Stripe who checks in daily and helps set up a new hire for success. My buddy and I talked about everything from how to build a productive relationship with my manager to working with other teams. He turned out to be an incredibly thoughtful mentor and we continue to meet consistently to this day. After getting up to speed on Stripe systems, current projects, and products (including Radar, the fraud detection product I'd be working on), I came back to the "what" of my career. What did I want to focus on? Frontend, backend, or all the layers in between? Did I want to solve problems for internal or external users? I was fortunate to have a engaged manager who helped guide me through these decisions. Another teammate encouraged me to turn to other engineers I interacted with on a daily basis, to observe what they do and how the various roles differ from each other. Stripe was at a size where there were a lot of amazing engineers working on fantastically different things, and pretty much everyone was willing to chat about why they loved what they were doing — and that part of Stripe engineering culture still holds true today. I started meeting with engineers on various teams to explore their broad range of perspectives. Some were motivated by getting deep into a particularly technical problem, while others were hyper-focused on user patterns and needs. And most, if not all, were personally invested in seeing my career progress, and encouraged me to explore all different parts of the tech stack. A year and a half later, I've worked on fraud prevention, fraud resolution (in the form of disputes), and most recently was on the team that launched Stripe Terminal, our card present solution. I've owned an API, dealt with incidents, missed deadlines, and been a spin-up up buddy twice — with my mentors and managers positively supporting the ups and downs along the way. Everywhere I look at Stripe I find interesting projects and teams. They inspire me to ask the tough questions, find better solutions, and challenge the typical way of doing things. Not only are they teaching me valuable technical skills, but I've been able to fine-tune what kind of mentor I aim to be. Interested in learning more about opportunities at Stripe? In the video above, team members explain why they like working at Tinder. One of the given reasons? The fact that their team works together collaboratively, which is also one of Tinder's admirable values. If you're interested in joining their team, click here to see all available opportunities at Tinder and don't forget to press 'Follow' to receive custom job matches, event invitations and more!